But, to return to the Buffett book, I am struck by another use of this book. That is as guide to the basics of how to read and interpret the important elements of a company’s financial statements. The book covers The Income Statement, The Balance Sheet, and The Cash Flow Statement. If you feel uncomfortable or completely ignorant of these three financial documents, this book might just do the trick. While you are learning about Warren Buffett’s approach to durable competitive advantage, you will be lead through a tour of these three statements. This is a very literal line by line march. For instance, thirteen chapters, averaging three pages each, cover all of the common elements of the income statement. With the example statement always in sight it is easy to follow the calculations to see what Gross Margin or Earning per Share mean. If you find Depreciation a mystery, this is covered too. In this era of excessive leverage, the book carries along a discussion of the impact of debt on the performance of a company. So, pick up this book at your local library or buy it. 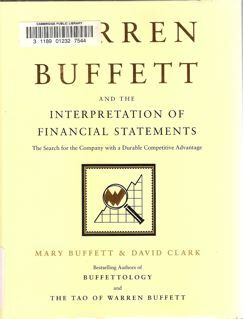 You will understand more about the how and why of Warren Buffett’s strategies and learn to understand financial statements. Then, get out your own statements and march through with this book as a guide. Peter Drucker wrote a charming little book in 1967, The Effective Executive: The Definitive Guide to Getting Things Done. I have now read it numerous times and each revisit rewards me. Drucker wrote in the same chapter, “It is more productive to convert an opportunity into results than to solve the problem — which only restores the equilibrium of yesterday.” This seems like quite a provocation to most managers. After all, managers and management are all about problem solving. Or so we seem all to think. But, from Drucker’s perspective, problems are always about the past. This is very clear from his notion that solving problems only reestablishes the status of the past, some sort of guarantee that we can reproduce the results of the past. Whereas, opportunities are about the future. The future is where customers in the real world are, not in the past. Drucker sees the world as continually evolving and requiring new solutions to new problems, always defined by customers. So, then, back to where I started. One of the hardest things for any manager to do is to look away from the products and services of the past. These may very well still be producing revenues and profits, though analysis and planning are telling them that future customers and revenues must come from elsewhere.